Cloud computing offers many advantages: Fast implementation, efficiency, scalability and cost-savings are among the most important. At the same time, cloud computing introduces new challenges regarding access, data, and compliance management. Likewise, the integration of cloud services into your existing IT infrastructure and processes often is very complex. Univention Corporate Server makes the use of cloud services a smooth experience and gives you also control over your data and processes. With UCS you obtain a central identity management for all your cloud services and the possibility to easily extend your existing IT infrastructure by new cloud-based services or quickly build new infrastructures in the cloud. With only a few clicks the Univention App Center provides you with a large range of services and various connectors. Without a central identity management, assigning applications to employees, managing credentials or blocking access when employees leave the company are time-consuming and error-prone. With UCS this becomes very easy. Just think of the following scenario: An employee is leaving your company. With a single click in UCS you can ensure that he or she will not be able to access any of your data, systems or services, no matter whether you are using two cloud services or ten. 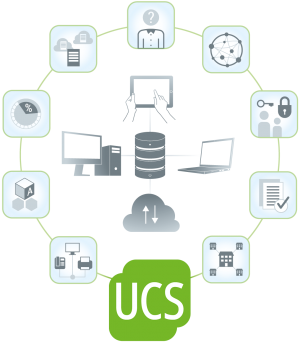 However, UCS goes beyond simple user management. 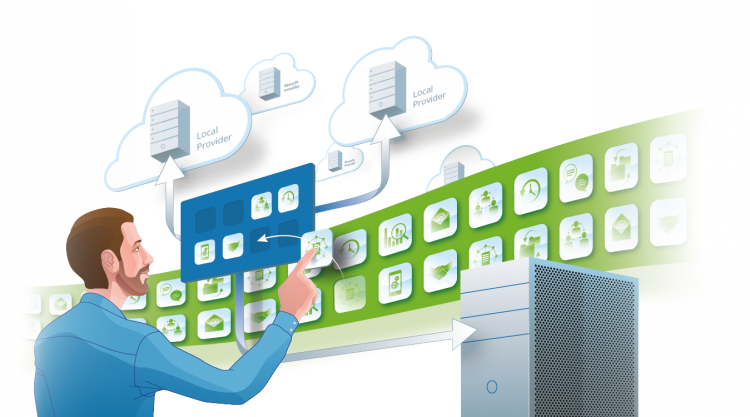 It is giving you the freedom to choose where you want to save confidential data, which applications you operate in your own data center, which systems run in the cloud and what to integrate from different Software as a Service providers. Have you ever wondered what happens to your data if you are dissatisfied with a service provider and want to switch to a different one? UCS is open source software, uses only open standards and can integrate many services. As UCS centrally manages your user data, a new system can be provisioned and given access to in minutes. By this your end users enjoy the convenience of using a single username and password for every application. You can either run UCS in your own data center, on Amazon Marketplace and by a cloud service provider of your choice. So it up to you where you want to manage your data and store your identities. For end users to use and manage web services through a central identity management function, operate them on-premises, and, if necessary, integrate them with existing IT infrastructure and migrate data without any loss or time consuming processes.